Ah, nostalgia time. Let me talk about how I remember this book. 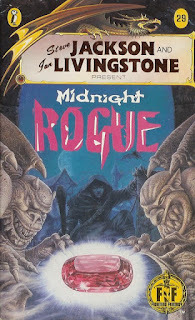 I don't think I played Midnight Rogue more than once or twice after I first found it, back when I was a kid. Being from a working class family, my grandparents would insist that we go to Blackpool for summer holiday each year. By the time I was 12 or 13, I was rather bored of it all. 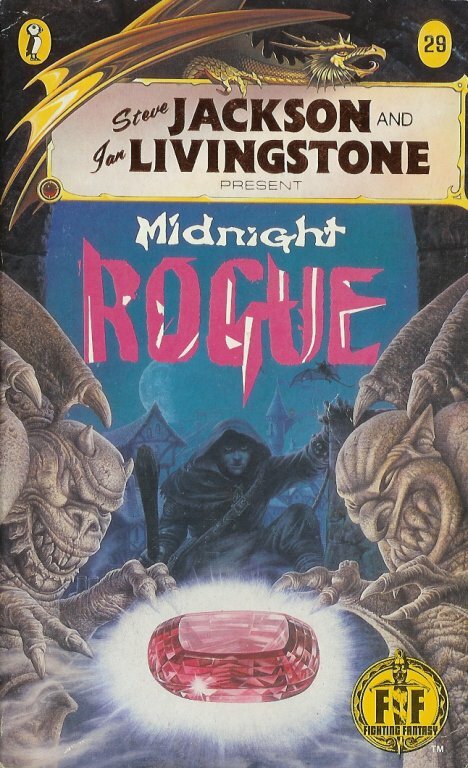 But one year, in the city's indoor market, I was able to find a copy of Midnight Rogue. I read through it in a day or two, and it still reminds me of Blackpool. The task is simple enough. You are a trainee in the Thieve's Guild in the city of Blacksand, and in order to earn your stripes and become a fully-fledged thief, you are asked to find a large gem called the Eye of the Basilisk. Easy enough, right? Course not! The gameplay in this adventure works the same as most FF books, with skills and stamina and no new stats. I rolled up decent enough stats, although my luck was rather low at 8. But you're given the opportunity to select from a variety of thief skills as well, from which I have selected pickpocketing, sneaking, and the ever useful spot hidden (which no game of Call of Cthulhu would be complete without). Rannik, the head of the thieve's guild, tells me that the gem belongs to a merchant. He tells me that this particular merchant's symbol is the coin, which I'm sure would be valuable information, if it weren't for the creeping feeling that this is probably the same symbol that every merchant in the entire world would use. I mean... you're a merchant. What ELSE would you use for your personal symbol? Anyway, I head out into Port Blacksand. I decide to start my investigation at the merchant's guild. I head out there and, on my travel, see a rustling near a patch of trees. I investigate, and am quickly attacked by a ghoul. I wonder why there's a flesh-eating ghoul just lounging around the city streets of Port Blacksand, but then I remember that I'm in Port Blacksand, a place which makes Ankh-Morpork seem cultured and polite. The ghoul is probably a citizen. After beating the ghoul to a pulp, I work my way into an alleyway beside the merchant's guild offices and high-tail it up a drainpipe. At the top of the drainpipe, one of the building's gargoyles comes to life and tries to kill me. My sword has no effect on it, and the book asks if I'd like to try something else. Naturally I take this option, and it leads to a segment which asks if I have a grapple, a cloak, or a heavy chain. I have neither, but there is no option to choose 'none of the above'. By the rules of this blog (no cheating, no turning back to previous segments, etc), I need to choose one of these items which I don't have. I settle for the cloak. Magically, a cloak appears on my character. He throws the cloak over the gargoyle, catching it and sending it crashing to the street below. Good to know that it wasn't just Revenge of the Vampire that suffered from lack of editing, eh? I slip into the guild via the skylight, and manage to find a door with a coin symbol on it. 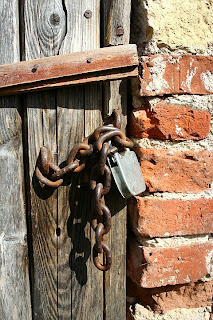 But I can't get into the merchant's office, because it's locked. So I'm told that I can't do anything else here, and should go to the merchant's house instead. Feh. The merchant lives in the rich part of town. And like all rich parts of towns, there are more police in that area, because the wealthy are the biggest thieves and crooks in the world. One group of city guards notices me, and I'm not given the option of bluffing an excuse to them as to why I'm here. Instead, I'm only given the options to trying to run, attacking them, or bribing them. I try bribing them. They aren't happy. Obviously I didn't give them enough money. They threaten to take me in, so I do what any sensible person would do in this situation - leg it. After I lose the guards in the maze of city streets, I eventually manage to find the merchant's house. The front door is locked, so I climb up yet another gutter pipe in order to get through the window. But there are bars on all of the windows. The only way in is via the door, and I can't pick the lock. The only option I have now is to try to pick, at random, a location where I think the gem is hidden. The book gives me four choices, and it's clear that one of them is the correct one. I'm not given an option to choose 'no bloody idea where it is', so I pick one, barrow hill, because it's the name of an adventure game I played on the PC a few years back. The others are either dull-sounding (a bridge or a street) or insanely dangerous (Lord Azzur's Palace), so even if this is barking totally up the wrong tree, at very least I'll be going somewhere vaguely interesting. So, I tear up my character sheet and make a new one, this time with a specialist skills in Sneaking, Picking Locks and Pickpocketing. My stamina is a bit lower this time, but at very least I stand a better chance of actually being a vaguely useful thief. We start all over again, this time opting to go to a seedy area called the Noose in order to see if I can get some clues first. 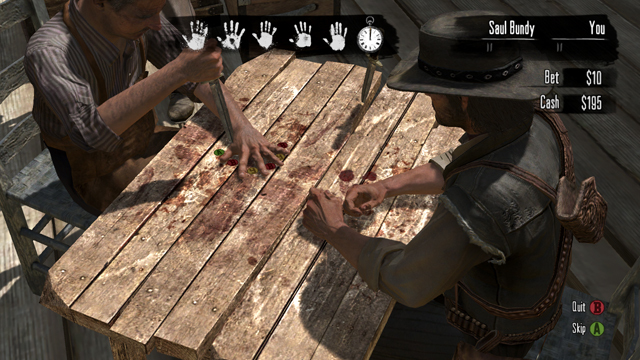 The Noose is a grimey, nasty part of town and I manage to waste some time playing games in the local pub. You know the game, it's the one where you try to stab a knife between your fingers and quickly wish that you'd chose a better game to play. Either way it earns me some gold, which I use to pay one of the local beggers for some info. He has no info, but gives me a grappling hook instead. That's... kinda like asking someone to go get you a bottle of milk, and they come back with a hammer. The adventure then takes a rather odd turn, as I venture onto a dark desert highway. I feel cool wind in my hair and smell colitas rising up through the air. Up ahead in the distance, I saw a shimmering light, and soon I had to stop for the night. I see a woman standing in a doorway of a hotel, and while I heard a mission bell ringing in the background, she lit up a candle and she showed me the way inside. As we walk through the chambers, the woman shows me a lot of pretty, pretty boys she calls friends who dance in the courtyard, it's all quite strange. When I finally get to my room, I called up the Captain, and asked him to please bring me my wine. He said, "We haven't had that spirit here since nineteen sixty nine". I confront the woman about this, all very confused, and she said "We are all just prisoners here, of our own device". I tried to explain to her that I really had no idea what she was talking about and just wanted to leave, but instead she invited me to the master's chamber to enjoy a feast with the other guests. The feast was a bit weird though, because when the gathered guests stab it with their steely knives they just couldn't kill the beast. I'd had enough of this silliness at this point, and the last thing I remember, I was running for the door. While scrambling to find it, I bump into the night porter, who tells me that although I can check-out any time you like, I can never leave. So I stick my sword through him, kick down the door and flee back into the city. Feh. Stupid hotel. I really don't know why this was even part of the adventure, to be honest with you, it's all quite odd. 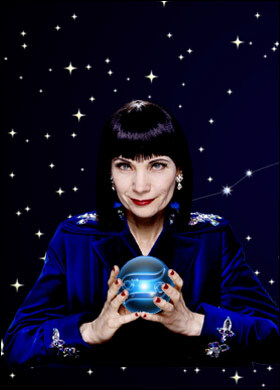 In desperation I go to see a psychic, Madame Star. She tells me that I am on a big quest to find something, and that I will need to go to somewhere of sleep and somewhere of work. So, the merchant's home and office... oh gosh, thank you. Her prediction was then followed by a heavy thumping sound, caused by my head hitting my table very hard. At some point, I need to stop basing my important life decisions on information I've bought from Mystic Meg's Psychic Charlatan Store! So, let's make this nice and short. I go to office. 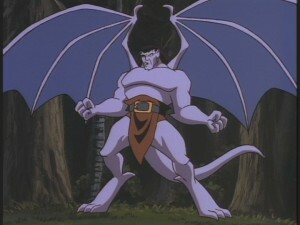 Now that I have grappling hook, I hit gargoyle with it and therefore manage not to lose my precious non-existent cloak. I slip through the skylight again, but without my spot hidden skill, I manage to accidentally step on a hidden switch which opens a secret panel in the wall. Inside the panel lurks a small creature, a Jib-Jib. Essentially a Tribble with feet, the Jib-Jib threatens to scream the entire place down with its cries that can be heard for miles around. Kinda like an alarm system that you need to feed. I stick my sword in it before it can scream. Thankfully I'm now able to get into the merchant's office, and raid his desk drawer for information. It tells me that yes, the gem is hidden in Barrow Hill. Astonishing. He has a few coins and a key hidden in the drawer, but the office also has a heavy steel door that may lead to a more interesting treasure. Naturally, I want to get it. So I pick the lock and head into the other room. Once inside, I find a large treasure chest. It tries to eat me. 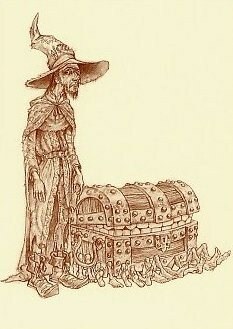 Great, I've stumbled across Rincewind's Luggage. Why is this even here? Does the merchant routinely lock monsters in the spare office rooms? I start to get worried about the merchant's guild. Their alarm system is a living creature, their treasure chests are made of Sapient Pearwood, I'm half expecting that the heavy iron door to come to life and - oh crap, the door's swinging shut. There's a small mark on the wall which, if I can read secret signs, may have told me how to escape from this room. But I don't have that skill. 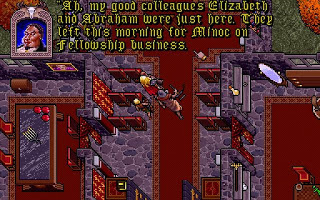 As a result, I am locked in the spare office room with a dead treasure chest monster, and there I am to stay until the merchant opens up the door the next morning and I get dragged out of the place by angry city guards. Yeah, suffice to say I'm not going to finish this one. Ah, but the game doesn't end there. You see, there's a twist in the tale. Naturally, this means that the next point is a spoiler. It's also recalled entirely from memory. I did say that I had strong memory about this book, didn't I? You see, when I was a kid, I'd cheated my way through all of these books, naturally. At the ending of this story, you do indeed uncover the gem. But it's a fake. In fact, the entire adventure was a fake, orchestrated by the Thieve's Guild. Every step of the way has been planned, plotted, and constructed. Which makes it one of the most lethal 'tests' possible. All of your guildmates turn the lights on and celebrate your accomplishments with a big party. It's a real twist in the story, and made the book memorable as a kid. But thinking about it now, as an adult... I hate that. I mean, what if I'd have got eaten by the ghoul? "Oh, I'm sorry," Rannik the Thieve's Guild Master would say, "But you failed the test by getting your limbs ripped off by our pet ghoul. No guild membership for you." I mean... if it's a test to see if you'd make a decent member of the club, maybe it'd be an idea not to have the entry exam be lethal! Let me tell you a story. When I was a little older, I had a copy of Ultima 7. I loved this game. 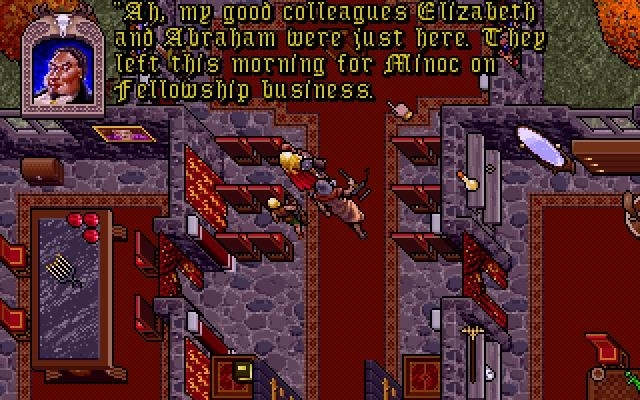 As part of the game's quest, you need to infiltrate a sinister religious organisation called the Fellowship. The head of the Fellowship, L. Ron Hubbard (named Batlin in the game, but we know who he really is!) asks you, as a new recruit, to head to an abandoned dungeon and pick up some gold they'd stored there. Abandoned dungeon. And he assures you that it's totally harmless and that there's nothing dangerous at all. Once you get to the dungeon, you find that it is full of DRAGONS. One of the most dangerous enemies in the game. Just one of them can kill you, and there are whole swarms of the buggers here. If you return to Batlin with the stuff he asked for and complain that he, like the Thieve's Guild Master, had sent you off to die in a lethal death-trap of fiery and tooth-filled doom, he just says "Woops, I must have been mistaken. Oh well. Would you like a cup of tea or something?" Overall, this book has some lovely ideas. It's got a great premise, and looks at the Fighting Fantasy genres in a whole different light. It does use the setting of Port Blacksand to its advantage, and the idea of gathering info before hitting the dungeon is great. But... it all fails in execution, for the reasons detailed in the playthrough. Which is a damn shame, and I'm very disappointed that this book was less fun to play through honestly and properly than it was to just cheat my way through. Hey, actually.... wouldn't it be a nice idea if the only way to win at this gamebook IS to cheat? That'd be some real lateral thinking problem solving there, eh? It's certainly not on my top five list of the most disappointing things in the history of the universe (a list which consists of the video games Ultima 9, Mass Effect 3, the movies Highlander 5, Star Wars Episode 1 and The Hobbit, and the last of Stephen King's Dark Tower novels), but I don't speak for everyone. If you've finished this gamebook, let me know what you think.